The Webster Groves & Fenton RR was planned from the start as an operations oriented railroad. The goal was lots of switching and as many trackside industries as possible to create traffic. Attempting to duplicate miles of railroad in HO scale (where 60.8 actual feet = 1 scale mile) is very difficult on a basement size railroad, so compromises had to be made regarding distance between areas of activity. The time period of the 1980s to 1990s called for longer trains, but I had to compromise on that as well. The finished railroad has a single track main line length of 123 feet. My primary goal was to create an operating schedule that could be run in about three hours. I started out in 1994 as soon as the track work was down and some scenery was in place. The first sessions were very informal using hand written switch lists made up on the spot. I would invite a random group of guys over and we would run the switch lists as best we could. These early switch lists were the basis for my emerging operations schedule. In 1996 I decided the computer was a much more efficient way to keep switch lists. The next step was to get organized and put the trains in some sort of order. Since I was not interested in doing it exactly like any prototype, it was a simple matter to number the trains I had staged and send them out in that order. Trains with an out and back movement received two numbers to indicate outbound and inbound moves. This was the beginning of monthly operation on the railroad. It soon became apparent that we had too many through trains, so I started tweaking the schedule and eventually created a total of 13 jobs that could be done in about three hours with a crew of 7 to 9. I was not able to eliminate all of the through trains on my first pass at a schedule. I still did not have enough trackside industries, nor did they match the freight we were trying to deliver. You can’t have coal hoppers at a grain elevator or tank cars at a rock quarry. I had way too many flat cars with nice loads and no place to deliver them. I had boxcars with roof walks and gondolas with rivets. This was when I entered into the brutal phase of “thinning the herd.” I also began system wide replacement of plastic wheel sets and conversion from friction bearing to roller bearing trucks. All rolling stock was weighted to NMRA standards and couplers were body mounted. I had to get rid of any freight cars that did not fit the era or were of no use on the railroad. I gave some away, sold some and finally arrived at a nice balance with 230. I will not add more, if I get something newer or better, then something else goes. It is a discipline that must be adhered to in order to run 13 trains as scheduled. During this period I also revised several industries by replacing them with enlarged structures to handle more traffic. I soon realized the passenger depot was taking up too much room, so I made a serious revision that added the 25 car capacity Webster Yard. This had the added benefit of one more crew position. 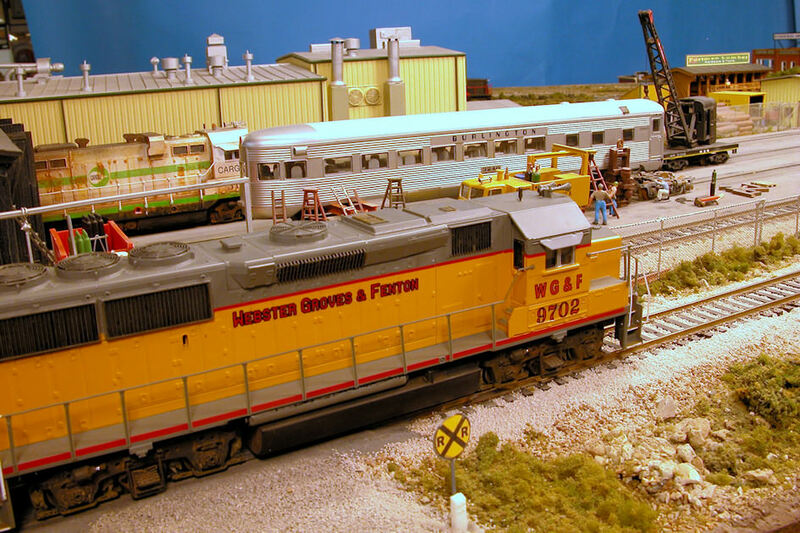 A scratch built Frisco depot now serves the railroad but does not dominate the real estate. Fast forward 15 years and here we are with operations controlled by one piece of paper for each job. In the past 10 years, the use of the computer to create track warrants, car cards, operating orders and switch lists has become more common and is an easy way to get your paperwork in order. 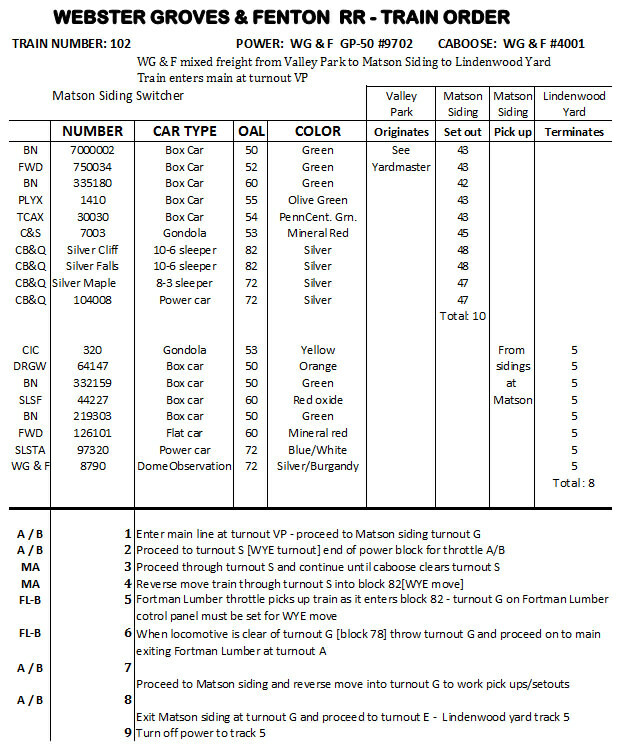 While many still use car cards, waybills, switch lists, timetables and track warrants, I believe the single sheet Train Order done as a Microsoft Excel spreadsheet is the best method for operations on the Webster Groves & Fenton. Another feature of this system is that the jobs are re-set after each session so the paperwork remains the same. I run all jobs in reverse to re-set. This gives me an opportunity to correct problems such as missing coupler springs and car details that are inevitably damaged during the sessions. Another advantage: I get to run my own railroad once a month. My response to critics of this style of operations is this: If you run any railroad every month, eventually you come to know by the name/number and makeup of a train where things go. You will not be delivering that string of coal hoppers to the grain elevator, nor will you set out those tank cars at the saw mill. This holds true for any operational system. I like to say it is not wrong, it is just different. I do rotate a few cars now and then due to newer replacement cars that are 62’ instead of 50’ and so on. When resetting, I often move cars as far from the industry as possible to create work for the crews. Blind sidings provide storage for empties along with the need to work facing and trailing point moves. The railroad has a single track main line with a loop for continuous running, but during operating sessions it runs as a point to point layout. A master schedule sheet provides the dispatcher with the overall game plan and features spaces to fill in crew names, throttles, and times. 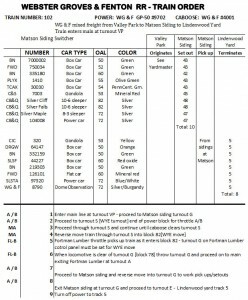 Each train order has notes describing the details of the switching moves. Sidings are all numbered and turnouts are lettered. The control panels have full details showing numbered sidings as well as lettered turnouts. Manual ground throws are all close to the fascia. Stall motor switch machines are used on most of the turnouts. All of the turnouts on the main line are signaled to indicate position. Control panels at both yards and at Valley Park feature red/green LED turnout position indication. I use ¼” diameter metal discs soldered to 0.031″ music wire with turnout letters on them to assist crews in identifying the various powered turnouts in the switching areas. These can be rotated sideways for photography making them invisible. Blocks are identified on the railroad with end of block signs and yellow paint on the rail joints. Other operational aids include clearly marked names on all major areas of activity, place names and directional arrows for all destinations mentioned on the train orders. These items are all generated on the computer as a Microsoft Excel spreadsheet using Microsoft Word Art and Shapes. I provide hooks to hold the clipboards with train orders and schematics as well as cup holders for beverages. Pencils are provided for use in marking off cuts of cars on the train order as they are blocked. The floor is covered with black foam rubber interlocking squares and I have numerous bar stools for seating. Various devices for uncoupling cars are provided since everyone seems to prefer a different type. The most recent is a ¼” wood dowel sharpened in a pencil sharpener. The BN had gotten rid of cabooses by the 80s, but as late as 1993 there were still some holdouts. There was even one in the small Hall Street Yard in north St. Louis, MO. The yard crew used it to eliminate long walks in the cold when blocking cuts of grain cars. It had been taken off the books and somehow escaped the cutting torch. It was lost to the BN but not to the yard crews who made good use of it. My wife likes to see a caboose on the end of a train, so we run them on the WG&F. 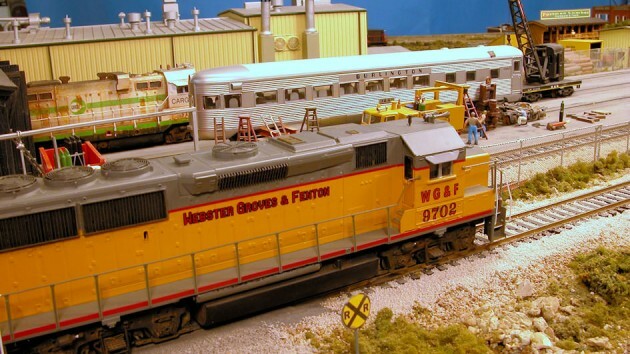 American Model Builders has released a series of ex NP and GN short wood cabooses that were painted BN Cascade green. I built these up in BN paint as contest models just for fun. Train #102 The Matson Siding Switcher is a local that runs from Valley Park to Matson Siding then on to Lindenwood yard. Matson Siding is a maintenance and repair facility specializing in restoration of private passenger cars, Amtrak certification, repair of freight cars and general rolling stock maintenance. They also do light maintenance and repairs on diesels. This provides ample opportunity to vary the cars coming to the facility. The paperwork is typical of the jobs run on the WG&F during one of the monthly sessions. This train is put together by the Valley Park crew and has the power attached. Dispatch is notified of the status on #102. When a road crew becomes available, the dispatcher contacts the Valley Park crew. Dispatch sends a road crew over to take 102 out on the main. The road crew takes the train order and checks the consist. Train 102 enters the main at the Valley Park turnout and proceeds to Matson Siding where the train enters the wye tail track. It runs forward down the main and once the caboose is clear, the turnout is thrown for the wye and 102 backs on to the wye. 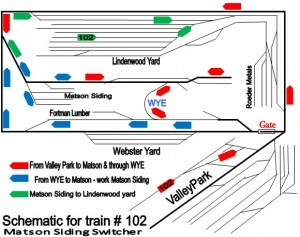 When the locomotive is clear of the exit to the wye, that turnout is thrown and 102 gets permission to use the main to proceed back to Matson Siding where it now has all trailing point moves working the siding. 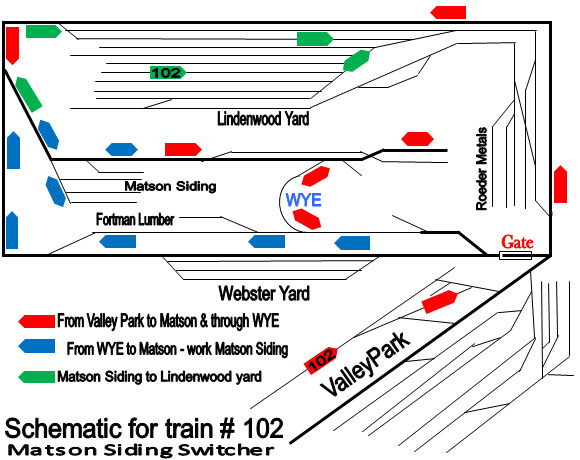 When all switching is complete, 102 gets permission from dispatch to move to Lindenwood Yard where it ties up. There is no substitute for running regular operation sessions to gain experience and confirm your general direction as the railroad takes on a more finished look and the operating crew becomes more familiar with your overall operation scenario. Early sessions pointed out the need for changes in rolling stock and a switch from 6-axle diesels to 4-axle units. The reason for the change was the fact that shorter trains did not look correct with the larger diesels. These are things that were not evident when doing the track plan. A good track plan is still a requirement, but feedback from operators is critical when fine tuning the operation. The goal for me was to have a reliable smooth running railroad that was enjoyable to operate. A local OpSIG expert once remarked that you can always get crews to come out once, but unless the railroad runs well and is easy to understand, they will not return.